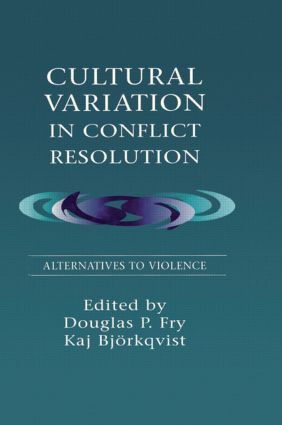 This volume's central purpose is to provide a clearly written, scholarly exploration of cultural variation regarding conflict resolution and in so doing, highlight certain alternatives to violence. It presents an interdisciplinary examination of how conflicts are perceived and handled in a variety of cultural settings. Drawing on data and models from anthropology, psychology, and political science, the chapters analyze conflict resolution across the societal spectrum, including cases from Western and non-Western traditions, complex and tribal societies, and violent and non-violent cultures. While demonstrating the extremely important impact of culture on conflict resolution processes, the book does not solely emphasize cultural specificity. Rather--through introductory chapters, section introductions, and a concluding chapter--the volume editors draw attention to cross-cultural patterns in an attempt to further the search for more general conflict principles. An explicit message throughout the book is that alternatives to violence exist. The volume demonstrates that at various levels--from the interpersonal to the international-- conflicts can be handled in ways that cause far less pain and destruction than violence. Chapters by psychologists discuss social and cognitive processes for facilitating the learning of alternatives to violence among children and youth. Anthropology contributors explore mechanisms for dealing with social conflict which allow some cultures to remain relatively peaceful and consider implications of their work for reducing violence in other societies. Chapters by former President of Costa Rica, Oscar Arias, and by political scientists examine how non-violent political solutions can be employed as alternatives to warfare and violent resistence.